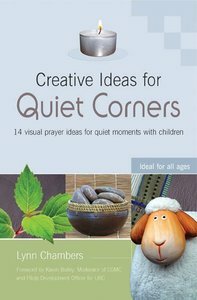 About "Creative Ideas For Quiet Corners"
Lynn Chambers has over 20 years experience of working with children through teaching, in holiday clubs and Sunday schools. Lynn was Diocesan Children's Officerfor St David's Diocese from 2001-2006 and is now a non-stipendiary curate in Carmarthen. She is joint author of Play and Pray through Lent and Play and Pray through Advent.